Handbags at dawn, martinis at sundown. The queue for handbags (and gladrags) on 26 December last. BROWN THOMAS ON Dublin’s Grafton Street has been granted a full pub licence. The decision was confirmed in the Circuit Licensing Court earlier today. Constance Cassidy SC told the court that refurbishment on the third floor of the landmark department store had been carried out in accordance with planning permission. She told Circuit Court President Mr Justice Raymond Groarke, who last month granted the store a Declaratory Order, that renovations and refurbishment had been completed and the store was now applying for a drinks licence. The court had heard the store had been operating a wine licence in its restaurant for the last 40 years and now wished to improve the range of drinks on offer. Ms Cassidy, who appeared with barrister Nicola-Jane Andrews and Compton Solicitors, said Brown Thomas & Co Ltd had bought a full pub licence from Falcon Irish Pubs Limited, which owned Ned McKnights on Main Street, Cappamore, in Co Limerick. Architect Frank Kenny told the court that planning permission had been granted for a new kitchen and carvery area, dry goods and refrigerated storage areas, dining areas and staff facilities. Lorraine Bedford, health and safety compliance manager with Brown Thomas, said the Fire Officer had inspected the premises and was satisfied works had been carried out according to the planning permission. Ms Bedford last month told the court the store wished to make a full drinks menu, including beer and spirits, available to customers. Judge Groarke today granted the store an ordinary seven-day publican’s licence. 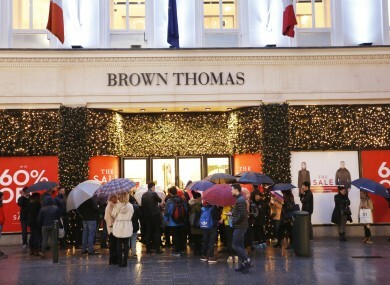 Email “Form an orderly queue: Brown Thomas has been granted a full bar licence”. Feedback on “Form an orderly queue: Brown Thomas has been granted a full bar licence”.